The MOAC foundation (MOAC) has released a next generation blockchain platform. With a pioneering Multi-Blockchain architecture, MOAC not only addresses the performance and cost issues with existing blockchain systems, including Bitcoin and Ethereum, but also introduces new features that minimize the barrier to entry for developers, users, businesses, and the entirety of the blockchain ecosystem. The new platform achieves this by using a layered Multi-Blockchain architecture, blockchain sharding, MicroChain, Smart Contracts, and Cross-Chain capabilities. The underlying architecture of the MOAC Platform is a Multi-Blockchain consisting of a global primary blockchain, MotherChain, and additional MicroChains. Using blockchain sharding tech- nology, a MicroChain functions as a child blockchain within the platform that operates above the global MotherChain, and is responsible for Smart Contracts management. MicroChains also enable high volume transactions using a variety of consensus systems. Consensus system is an agreement system that provides accountability and verification of transactions. The platform’s advanced layered Multi-blockchain architecture increases overall transaction processing speeds up to 100x faster (TPS) than existing blockchain platforms. Meanwhile, Micro- Chains enhance token concurrency rates up to 10,000 times, for a truly scalable solution. 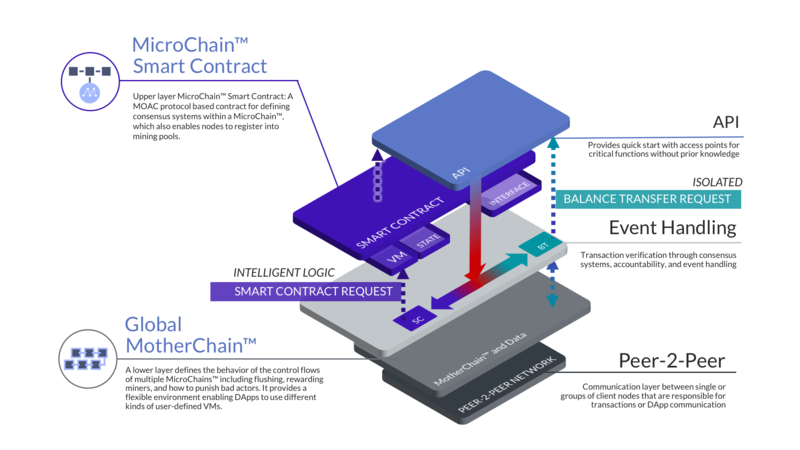 MicroChains significantly reduce the cost of smart contract operations and allow developers to rapidly test different application and service ideas. MOAC’s MicroChains are able to interconnect with all other non- MOAC blockchains using Cross-Chain capabilities. This allows both users and their decentralized applications (DApps) to migrate easily to the MOAC Platform, with no prior blockchain knowledge. It also provides a decentralized file storage solution which is currently missing from other major blockchains. MOAC incentivizes mining as well as rewards for the entire ecosystem. The MotherChain uses a proven Proof of Work (PoW) model, similar to Ethereum, so that miners and mining pools have opportunities to participate in mining the MotherChain. The MOAC Platform provides additional MicroChain mining and validation and provides mechanisms for mining from mobile devices, including smart phones. By reducing the barrier to entry for both mobile users and server farms, the MOAC Platform offers a truly scalable ecosystem for developers and their Smart Contracts, enabling developers to create innovative DApps with lower operating costs, enhanced capabilities, and improved performance without a reduction in security. 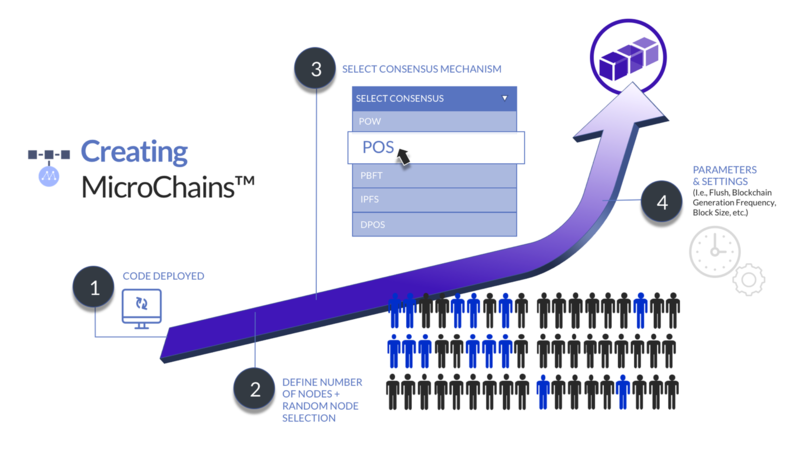 With the ability to have MicroChains in a layer above the MotherChain, each MicroChain can have its own unique consensus system and algorithm. For example, you could create a MicroChain which uses a Proof of Stake consensus model specifically for scalable rapid high volume transactions. A Proof of Stake (POS) is a type of algorithm by which a cryptocurrency blockchain network aims to achieve distributed consensus. Instead of processing large amounts of data like a strictly Proof of Work blockchain, a Proof of Stake blockchain relies on validator nodes within a network to verify transactions. In Proof of Stake blockchains, the creator of the next sequential block is chosen by randomized algorithms based on a combination of factors such as wealth or age (I.e., the stake). The advantage of a Proof of Stake system is that it is fully scalable for enterprise-level volume, is energy efficient, and supports variable transactions. It also increases verification capacity proportional to the number of nodes on the network, and enables microtransactions within DApp MicroChains without having to constantly access the MotherChain. In addition to Proof of Stake and Proof of Work blockchains, the MOAC Platform can also support additional plug-and-play consensus systems such as Proof of Activity, Proof of Burn, Proof of Elapsed Time, etc. Since MicroChains are isolated, they can run a variety of virtual machines for Smart Contracting on a per instance basis. This enables MicroChains to initiate a wide range of business logic and DApp use cases. In addition, it enables the use of different file systems such as IPFS, sensor networks for data storage, and MicroChains can even be implemented by artificial intelligence. MOAC’s Smart Contract system is fully compatible with Ethereum’s EVM system, supporting ERC20 and ERC721 token standards. There are currently 56 million MOAC coins in circulation, with an additional 94 million in reserve for a total supply of 150 million MOAC coins. The for-profit entity holds 31 million coins, and the MOAC foundation holds 63 million. 31 million is funding the ongoing Multi-Blockchain development. The value of each MOAC coin fluctuates daily, and can be found at CoinMarketcap.com. 6 million additional coins per year will be generated during mining, further increasing the supply in circulation. After 4 years, the production will halve to 3 million, then will halve again the following 4 years. The total supply will be 210 million coins by 2058. Does cloud mining make financial sense? Next: Nodis Token : Social marketing platform. Get noticed!